The Garden Salad Pack is so popular because lettuce and other salad greens can be grown indoors (year-round) or outdoors and in all light conditions including no direct sunlight. The Salad Pack of lettuce and salad greens provides the quickest growing, highly nutritional varieties you can find, all 100% non-hybrid and non-GMO. From seed to your table in less than a month, indoors or out. Make sure your family has the Garden Salad Bowl Pack for your health and well-being. For a bigger sprouting seeds pack, try the Sprouting Seeds Pack. For all our specialty packs look here, where you can see our new Tea Garden Pack , Home and Professional Medicine Packs , Home and Professional Kitchen Herb Packs, Fruit, Chili and Tomato Packs and we even have a Livestock Pack. Arugula is an aromatic, peppery salad green. It is also known as roquette, rocket, rugula and rucola, and is very popular in Italian cuisine. It grows wild in Asia and all over the entire Mediterranean --- and has been known to be cultivated and enjoyed in places as exotic as the north of Sudan. In Roman times arugula was grown for both its leaves and the seed. The seed was used for flavoring oils. Cress is a biennial herb, native to southwestern Europe, but is also cultivated in America. It is also known as American cress, bank cress, Bermuda cress, early yellowrocket, and early wintercress. Upland cress is considered a satisfactory substitute for watercress. It can be used in sandwiches or salads, or cooked like spinach, or used in soup. It can be grown easily in any garden. Upland cress has a sharp, peppery flavor. It has heart-shaped leaves that have a radish-like flavor. It has been cultivated in Europe since the 17th century. Chicory has been cultivated for over 1000 years, but it is still very wild-looking. It is a native of Europe but it is as common as a weed in the United States. It is a hardy vegetable that is used in three basic forms. The roots of chicory can be dried, roasted, and prepared as a substitute for coffee. The greens, which are slightly bitter and resemble dandelion greens, are grown and used as potherbs (leaf vegetables). Chicory is also known as Italian dandelion. Radicchio is a leaf chicory. It is sometimes known as Italian chicory. It is grown as a leaf vegetable and usually has white-veined red leaves. The taste can be described as bitter and spicy. The taste is more mellow when it has been roasted or grilled. Modern cultivation of the plant began in Italy during the 15th century. It is typically eaten grilled in olive oil, or mixed with pasta dishes. Dutch corn salad is also known as Lamb’s Lettuce. It is a cold tolerant plant. It is one of the tenderest of all greens. The flavor can be described as mild and nutty. Dutch corn salad is an excellent addition to salads and garnishes. Dutch corn salad is full of nutrients, and contains three times as much vitamin C as lettuce. It is best if gathered before flowers appear on the plant. Endive is a half-hardy biennial that is grown as an annual. It has a large rosette of toothed, curled, or wavy leaves that are used in salads as a substitute for lettuce. Buttercrunch lettuce is a heat-tolerant, Bibb-type of lettuce. It has rich green leaves, sometimes tinged with red. The leaves form a lovely rosette of dark green leaves with a white-yellow heart. Buttercrunch lettuce is a good source of vitamin A and phytonutrients. Its leaves are buttery, chewy, crisp and sweet, and make a wonderful addition to salads. The flavor of Oakleaf is distinctive. It has a slight mineral component combined with nuttiness, and rather than the tang of Romaine, there's the suggestion of white wine. The leaves are thin and tender. If you use it in sandwiches, they should be eaten shortly after preparation, as the lettuce will wilt otherwise. If you use it in salad, you probably want to use a thin dressing, rather than burden the leaves with a heavy cream. The lettuce's flavor will go well with the usual salad accessories (tomato, cucumber, scallions) and is a good complement for almonds or walnuts, too. The color and shape of Oakleaf make it useful as a garnish or as a base for presenting various other foods, but it would be a shame to leave the leaves uneaten. Add a splash of color to salads! Reddish-bronze leaves are long, deeply lobed and have a delicate flavor and texture. Slow bolting variety allows for a long harvesting period. Named for Parris Island off the coast of South Carolina, this old favorite Romaine deserves a try by any lettuce lover. 'Crunchy leaves', 'creamy white heart', and 'vigorous' are just a few of the words that describe this variety. Mesclun lettuce is also known as wild or baby lettuce. Mesclun isn't a single variety of lettuce. Rather, it's a combination of several varieties of loose leaf lettuces, all in one seed packet. It originally came from European nations specifically the Italian and French regions. Today it's gaining popularity all around the world. The dictionary definition states it can also contain a variety of herbs and even edible flowering plants. 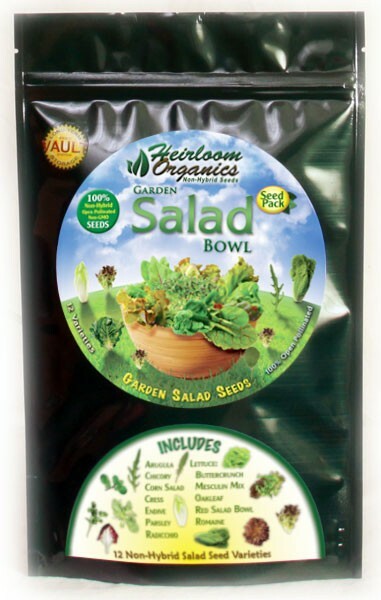 Gardeners love this loose leaf mixture, as it spells "variety" in the salad bowl. Mesclun lovers savor the varying colors, textures, and tastes. Grow mesclun lettuce for a delicious addition to any salad. Italian Giant is a variety of flat leaf parsley. It is an herb that typically grows as a biennial. It is easy to grow, and is great for beginner gardeners. It is an edible herb that can be preserved by either drying or freezing it. Parsley contains flavonoid, antioxidants, lycopene, and vitamins C and K. Raw leaflets can be added to salads, and is the preferred culinary variety of parsley because of its great flavor.